Genworth’s proposed acquirer, China Oceanwide, looks to be in the midst of a deep liquidity crunch. Following multiple FOIA requests, we were able to locate audits for the opaque Chinese conglomerate that show consistently negative cash flow and debt levels spiking to clearly unsustainable levels. We see almost no chance of regulators approving this deal. Doing so would hand control of Genworth’s assets to a faltering entity in a jurisdiction with limited recourse. A deep dive into Genworth’s insurance carriers show that the company looks starkly under-reserved. 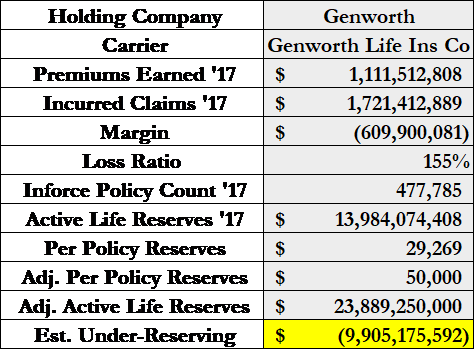 Our analysis indicates that Genworth’s LTC exposure is under-reserved by at least $9.9 billion. Overall we see this deal failing followed by an unwinding of Genworth. We’ve taken a significant short position in Genworth’s equity. In October 2016 Genworth announced that it would be acquired by China Oceanwide, an opaque private conglomerate based in mainland China. The deal has lingered for two years and despite Delaware recently scheduling a hearing on the matter we think regulatory approvals will never make it over the line. We were able to locate audits for the private China Oceanwide conglomerate following multiple Freedom of Information Act requests to various state departments of insurance. China Oceanwide’s finances show that operating and investing cash flow have been consistently negative over the past five years and have recently deteriorated further. Debt has skyrocketed to clearly unsustainable levels. A subsequent review of Chinese filings shows that the conglomerate has also pledged equity in its subsidiaries for loans, effectively levering the enterprise to the hilt. Given this combination of negative cash flow coupled with spiking debt levels we believe China Oceanwide is poised to become the next Chinese conglomerate meltdown a la HNA Group or Anbang Insurance. In light of these findings, we think this deal would create the sort of asset/liability mismatch that gravely threatens Genworth’s policyholders. It would give China Oceanwide control over Genworth’s assets, which could serve as a much-needed liquidity lifeline for the conglomerate. Meanwhile, the vast majority of Genworth’s liabilities (i.e. future claims by policyholders) would be based domestically in the U.S. This would make the deal incredibly dangerous for U.S. policyholders given the cross-border enforcement issues between the U.S. and China. The dynamic would make it virtually impossible for regulators to approve what looks to be a disaster in the making. All of this raises an inevitable question however—what is the back-up plan for Genworth if the deal fails? The options look thin. When asked by the JP Morgan analyst on the Q2 conference call what happens in case the deal isn’t approved, Genworth’s executives basically sidestepped the question and said they were 100% focused on this deal. They then suggested any back-up plan would likely include asset sales. Genworth has been a habitually underperforming insurance operator and our review indicates that it continues to be severely under-reserved. We performed a deep-dive analysis of Genworth’s GLIC carrier and estimate that its existing long-term care (LTC) exposure is under-reserved by $9.9 billion. Management’s position is that they are done adding capital to GLIC. We do not see this as realistic. We are hard-pressed to find examples of insurance holding companies that have left carriers for bankruptcy/receivership without experiencing adverse effects. With a market cap of $2 billion and long-term borrowings of about $4 billion (pg. 3), we believe adequate reserving would leave Genworth’s equityholders with nothing and would wipe out its bondholders. With a market cap of $2 billion and long-term borrowings of about $4 billion (pg. 3), we believe adequate reserving would leave Genworth’s equity holders with nothing and would wipe out its bondholders. In the end we think regulators are left with 2 unsavory choices: does Genworth fail domestically or does it fail internationally? Policyholders would be better off with a domestic insolvency versus a difficult cross-border wind-down but either scenario would obviously be a mess regardless. Anbang. In 2015 Anbang insurance attempted to purchase U.S. insurer Fidelity & Guaranty amidst an aggressive overseas expansion. Much like with Genworth/China Oceanwide, the deal managed clear CFIUS approval. However, it later failed after New York regulators chose not to approve the combination. This turned out to be a great decision. China later jailed Anbang’s Chairman for fraud and embezzlement and then took over the enterprise. Anbang is now managed by officials from Chinese financial regulators and government bodies. HNA Group. HNA is a Chinese conglomerate with an insurance subsidiary that has turned into the largest debt-laden pending failure the nation has seen. HNA went on a $40 billion overseas acquisition spree, buying up assets ranging from Hilton Worldwide to a large stake in Deutsche Bank. Chinese authorities eventually clamped down on internal control issues with HNA’s insurance subsidiaries and as of late the firm has been in the process of unwinding its numerous assets. HNA’s Chairman mysteriously died after falling off a wall in France this summer. 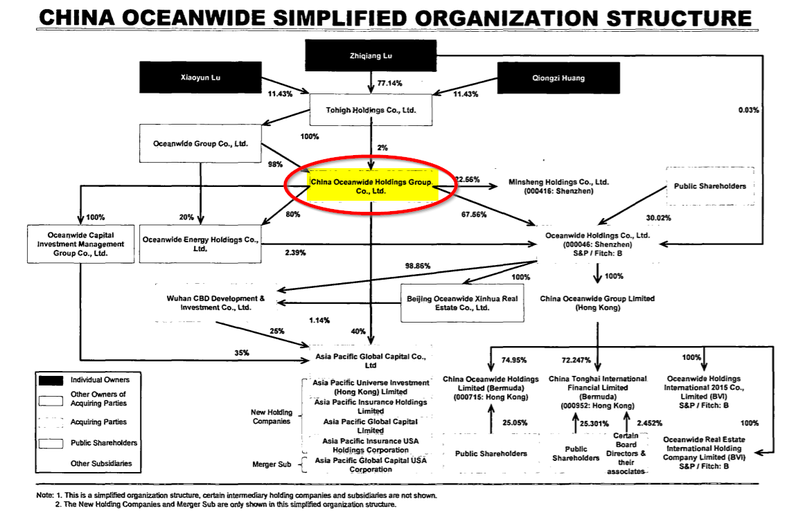 Similar to warning signs with Anbang and HNA, a review of China Oceanwide’s byzantine corporate structure shows that the conglomerate looks to be facing stark liquidity pressures of its own. 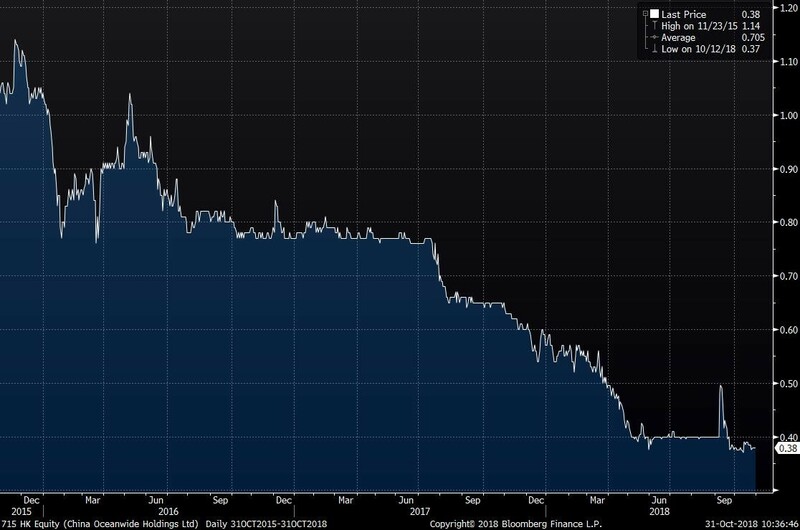 With operating cash flow worsening and with a massive stack of $11b+ of short-term debt coming due we think China Oceanwide’s situation is approaching near-term crisis levels. When further examining the China Oceanwide conglomerate we see additional warning signs underscoring its excessive use of leverage. Fitch recently lowered its rating on Oceanwide Holdings Co to B-. Fitch defines it’s ‘B’ rating as situations where a “material default risk is present, but a limited margin of safety remains”. 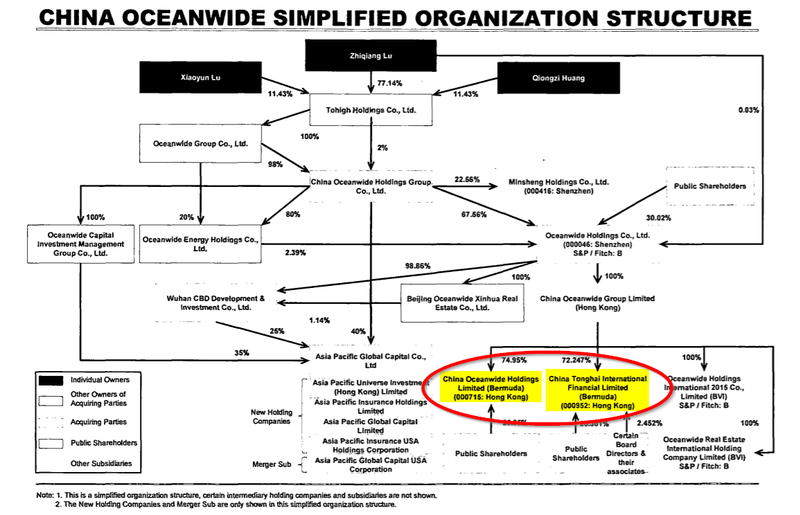 Despite S&P speculating that the parent company might be able to support Oceanwide Holdings it actually looks like the opposite is true. Parent China Oceanwide has pledged the vast majority of its stake in the ailing Oceanwide Holdings subsidiary—about 93.6% of its holdings—as collateral for its own loans. We can see this from Oceanwide Holdings’ first half 2018 financial report (pg. 45). 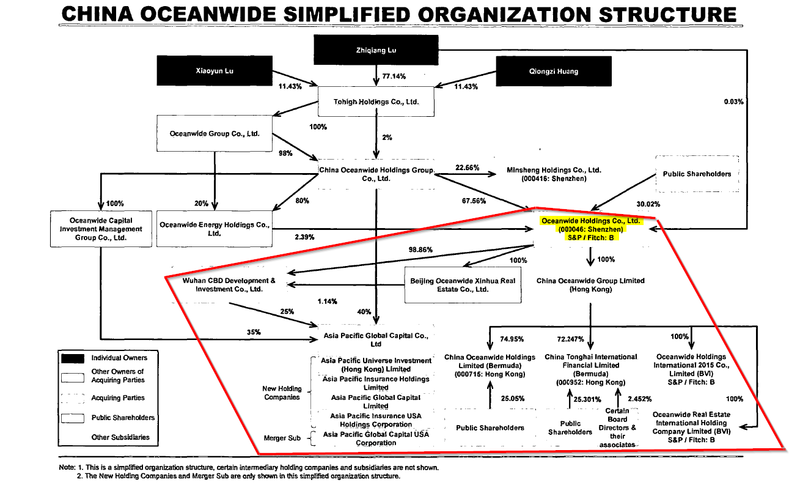 Parent China Oceanwide owns 3.526 billion shares of Oceanwide Holdings, and it has already pledged 3.301 billion shares, or about 93.6% of the total shares it owns as of June 2018. According to CTIF’s 2017 annual report (pg. 46), in September 2017 CTIF entered into a facility agreement with external financing provider Haitong International for an RMB 1.1 billion loan, pledging 3.2 billion shares of the company (representing 51.43% of the total issued shares) as of December 2017. Hong Kong exchange filings have similarly reported this pledge. Disclosures are murky on COHL but China Oceanwide looks to have pledged its shares in this entity as well. On October 06, 2017, Hong Kong exchange filings show that Mr. Lu Zhiqiang and China Oceanwide Group Limited owned 74.04% of the company. However, filings as of May 18, 2018 showed that Haitong International owned 58.19% of the company. It is obvious that the math does not add up in here. The overlapping ownership claims are likely to be due to a share pledge on this entity similar to the disclosed pledge between Haitong and China Tonghai described above. Overall, the entire China Oceanwide organizational structure looks levered to the hilt from top to bottom. The share prices for all 3 public companies in the conglomerate have declined precipitously in the past 3 years, which strikes us as an incredibly unstable scenario. In light of the above signs of illiquidity and leverage, recent changes to the Genworth deal structure give us further doubts about the viability of this deal. As of August 14th Genworth and China Oceanwide agreed to a 6th extension of their proposed merger. Whereas past extensions had mostly been focused on a simple lengthening of the closing timeline, the latest extension has proposed significant modifications to the deal structure itself. We think these modifications are yet another reflection of China Oceanwide’s deteriorating liquidity. In particular, earlier deal structures required Oceanwide to contribute $525 million to facilitate the “unstacking” of Genworth Life and Annuity Insurance Company (GLAIC) from Genworth Life Insurance Company (GLIC). Earlier structures also required Oceanwide to contribute $600 million to Genworth for the repayment of Genworth’s debt obligations due May 2018. Both of these up-front cash conditions were waived. Instead, Oceanwide has agreed to a capital investment plan that would allow it to contribute $1.5 billion “over time following consummation of the merger”, with final amounts to be contributed by March 31, 2020, well after the targeted deal closing. The proposed deferred capital infusion strikes us as a dubious proposition given the state of China Oceanwide’s financials. When digging further into the details of the new proposed deal structure (again through the Virginia DoI filings) we see how rickety the revised proposal really looks. It contemplates 2 funding “channels”. The first is described as “the same as the Original Funding structure” and includes cash from 3 of the mainland Chinese entities listed in the above org charts. According to the revised proposal this Original Funding channel is to provide only 35% of the aggregate merger consideration. We are unnerved by the fact that Oceanwide and Genworth are suggesting new, offshore funding channels that are potentially backed by affiliated bridge loans in a conglomerate that is already levered to the edge. The notion that such funding is to comprise almost 2/3 of the total merger consideration strikes us as grasping at straws. Earlier this week Genworth announced that it would be contributing $175 million from its holding company to its Delaware carrier. Similar to China Oceanwide’s deferred contribution plan, Genworth proposed making these payments after the hoped-for deal closing. We view this as little other than an attempt to rearrange the furniture on the Hindenburg. Any holding company cash that goes to a Delaware carrier is cash that won’t go to their other carriers. Genworth needs approval from multiple jurisdictions in order to close the deal. In the most recent Q3 release Genworth reiterated that results “reflected lower terminations and higher severity and frequency of new claims” which were partially offset by premium hikes and benefit cuts. We find it troubling that Genworth is looking to defer its LTC claims reserve assumptions at a time when (a) they acknowledge that claims have experienced higher severity and frequency and (b) when they acknowledge trying to close this deal in Q4. Frankly, this strikes us as an attempt to avoid taking an obvious reserve adjustment (and capital impairment) in order to grease the deal through. Our review of Genworth’s statutory insurance filings show that a massive long-term care liability looms. As has been widely reported, long-term care insurance has become an anchor on the entire insurance industry. Earlier this year, GE identified a $15 billion reserve shortfall in its legacy LTC book. The news sent GE’s shares down sharply and triggered an SEC investigation to review the situation more closely. Genworth was formed in 2004 as a result of GE Capital spinning-off most of its life, LTC and mortgage insurance products. The perception at the time among many industry experts and commentators was that the Genworth IPO represented an attempt to minimize the damage from GE’s problematic insurance exposure. Years after its IPO, Genworth’s stock subsequently cratered as under-reserving issues began to manifest. The company paid $219 million in 2016 to settle a lawsuit that alleged under-reserving in its long term care portfolio. 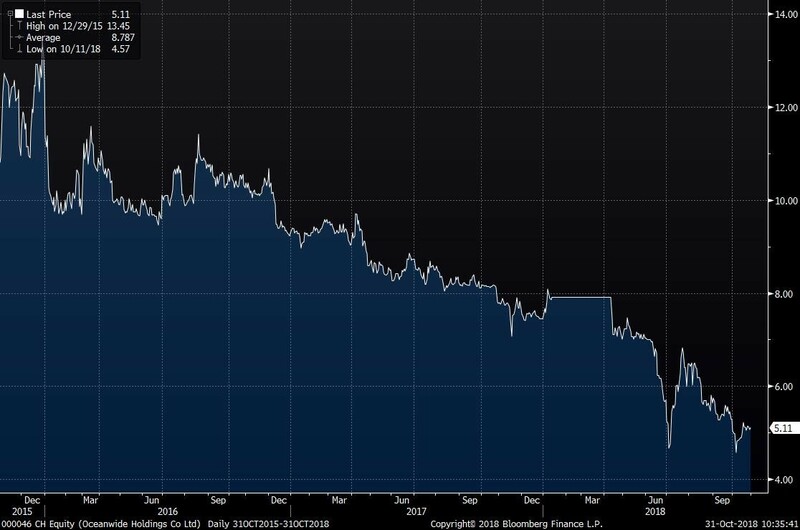 Despite Genworth punishing its policyholders with recent premium rate increases ranging from 50%-150% our analysis indicates that Genworth’s LTC book is still severely under-reserved. We performed a detailed peer reserving analysis of Genworth’s GLIC carrier to get a sense of its reserving situation. Note that Genworth is one of the few insurance providers that writes new LTC business. New policies can take decades to pay out new claims and therefore can mask underlying reserving problems taking place in more seasoned policies. Therefore, in order to perform a comparable analysis we isolated older vintage policies and compared the reserving of those policies relative to peers of a similar vintage. Our analysis isolates Genworth’s pre-2003 policies and compares their reserving practices against peers in order to see whether Genworth has safely managed its risk in this oft-troublesome cohort. Pre-2003 serves as a relevant marker because multiple other carriers have also acknowledged that their pre-2003 long-term care policies have been particularly problematic (pg. 24 and pg. 1). This was due to the loose underwriting standards of the era as these policies were sold amidst a period of intense market competition and a ‘land grab’ by multiple carriers for new LTC business. Genworth has recently become more vulnerable to these pre-2003 policies due to the expiration of reinsurance protection this year. Genworth’s reinsurance agreement had covered new claims on policies written between 1998-2003, per GLIC’s 2017 statutory MD&A (pg. 7). As of this year however, any new claims on these blocks become the full responsibility of Genworth. 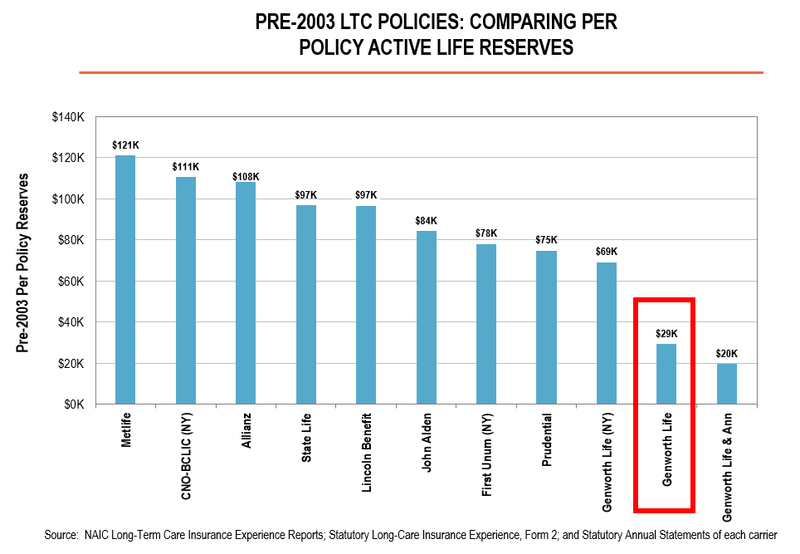 Reserving across competing LTC insurance carriers in this time frame should fall within a similar range given the comparable vintages and the competitive marketplace dynamics at the time, despite some differences in the nuances of coverage for each policy type. If the reserving were adjusted to $75,000 per policy or even $100,000 per policy we would possibly be talking about the largest insurance reserving shortfall in history. Rate increases can bridge some of this gap but it is clearly a major shortfall to cover. As a reminder, this analysis is merely limited to pre-2003 long-term care policies at one of Genworth’s carriers. Typically, when one major policy cohort is materially under-reserved we see similar issues across a company’s other carriers and policy lines. Suffice it to say we think Genworth’s carriers are in deep trouble—this strikes us as not even a close call. We think Genworth is insolvent just purely based on its LTC book of business. But putting aside LTC for the moment, Genworth’s current top performing business is mortgage insurance which is largely focused on markets in Canada, the U.S., and Australia. Mortgage insurance is a cyclical business that has performed well in the low interest rate environment we’ve experienced for the past 9 years. However, with rates rising this product line is slated to face the tail end of a business cycle for the first time in almost a decade. Canada and Australia are two markets that have widely been reported as being in the midst of real estate bubbles. Any trouble in these housing markets could prove to be major headwinds for Genworth’s mortgage insurance business. Canada’s housing bubble has been covered extensively in the press with reports that the bubble has begun to unravel. In February the FT wrote a piece entitled “Canada’s housing market flirts with disaster”. Later in June, the Globe and Mail ominously wrote: “The housing bubble is leaking air, but it’s just a start.” Since then, numerous publications have honed in on the rise of subprime mortgages, the clampdown on money laundering in the real estate sector, and other issues that appear to be reaching a breaking point. The Australia property market is similarly on shaky footing. Home prices have dropped year over year and numerous outlets such as the New York Times and local Australian media have been calling attention to the bursting of a bubble. While predictions of bubbles can be speculative and subject to high degrees of uncertainty, any broader economic downtrend will have a negative impact on this key line of business for Genworth. 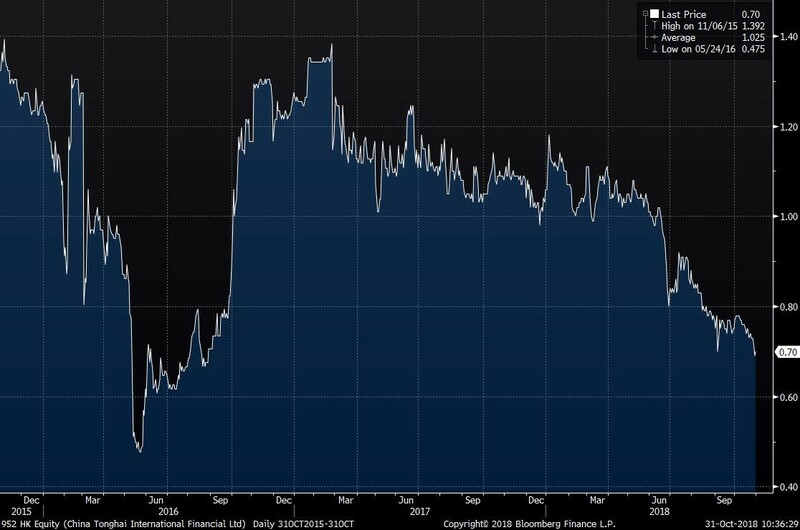 In the end we think the LTC business is Genworth’s biggest problem by a wide margin, but any loss of support from other lines of business could hasten a decline. Genworth announced in June that the proposed deal with China Oceanwide had cleared its review with the Treasury Department’s Committee on Foreign Investment in the United States (CFIUS). Many investors had apparently viewed the CFIUS review as a major hurdle; Genworth’s stock soared over 26% the day after the announcement. As mentioned above, Chinese conglomerate Anbang insurance serves as a precedent. Anbang’s attempt to purchase U.S. insurer Fidelity & Guaranty in 2015 managed to clear CFIUS approval, but later failed after New York regulators chose not to approve the combination. New York and Delaware have reputations as being among the more diligent state insurance departments. Neither state has approved despite the transaction having been announced about 2 years ago. Delaware recently scheduled a public hearing on the proposed merger which we view as inconclusive. Beyond the U.S., China hasn’t blessed this transaction either. Recently, Chinese officials have made a concerted effort to limit overseas investments in order to curb “irrational” investments and to prevent capital flight from the country. This strikes us as the precise type of irrational investment that would seem to fit those characteristics. All told, we see almost no realistic chance that regulators approve the completion of this deal. As an acquired entity, Genworth’s shaky financials would be inserted into an overseas empire that itself looks to be crumbling under liquidity pressures. Approving the transaction would essentially hand control of a massive and liquid portfolio of policyholder assets over to an opaque foreign conglomerate. The potential for abuse in such a scenario is high, and hurdles to any cross-border legal remedy would likely leave U.S. policyholders in a perilous position. A Genworth acquisition wouldn’t save China Oceanwide, though we think it would buy them some additional time before turning into an even bigger mess. As a standalone entity, Genworth seems hopelessly under-reserved and highly levered. Genworth’s backup plan if the deal fails looks to be virtually non-existent. As noted above, when asked on the recent Q2 conference call what happens in case the deal isn’t approved, Genworth suggested any back-up plan would likely include raising capital through asset sales. In the end we think there is almost no chance that this deal succeeds. The burden of the denial decision will probably fall on the Delaware and New York insurance regulators given that Genworth’s major carriers are domiciled in their states. If the deal falls part we think under-reserving and liquidity realities will quickly come to bear on Genworth. Best of luck to all either way. the improving profit of gnw should help in this consirpacy to torpdo gnw merger intentions. NY,will require a different set of rules for the deal. and its subsidery co will have to do this.but a DE approval would certainl;y help for the other 48 states. DE is a key state and several others have approved In merger acquirments in the past approvals has a in the over 50 yrs of nvesting and owner of 10 k shares tremendous effect on all other states De. is a sink or swim deal and gnw will not take it lightly for approval. Ive considered what happens if merger is not approved-with improved profit etc the balance sheet looks good and servivalable gnw has seen good napp earnings earnings for 2018 so far and cash looks sufficient to pay current debts with cash left over Either way with the merger i am satsfied . I have a LTC policy with Genworth Financial. My premiums have been going way up every year. It is now due again and I am starting to research and find out why. I am not sure what to do after what I have found.